At the end, inevitably, something happens. We all run out of holes. Exciting and suspenseful for fans, yes, but for the engraver it was a headache — a half-dozen players were in position late in round four to win THE PLAYERS Championship 1991. That there was heartache for some (Phil Blackmar, tied for the lead, found water at the island-green 17th), inexplicable misery for even icons (Tom Watson took 40 strokes to play the final nine holes and closed with a 77) and utter frustration for others (Paul Azinger played nicely, but just couldn’t make a putt as he closed with 74) was offset by the other side of the equation. When all 72 had been played, Elkington had prevailed, his 4-under 68 erasing a four-stroke deficit and win by one over Fuzzy Zoeller (72). Azinger, the third-round leader, settled into a share of third with Blackmar (70) at 276. “I just didn’t make it happen,” Azinger said. Ditto Zoeller, who had birdie tries from inside of 15 feet at each of the last three holes, only to miss each one. Ah, but just when the engraver was ready to give up, golf’s strongest field saw someone flex his might. Elkington made a clutch birdie at the 72nd hole to win the prestigious championship. The Australian was the second foreign-born winner of The PGA TOUR’s showcase event in five years and for a third straight time at THE PLAYERS, the margin of victory was one. 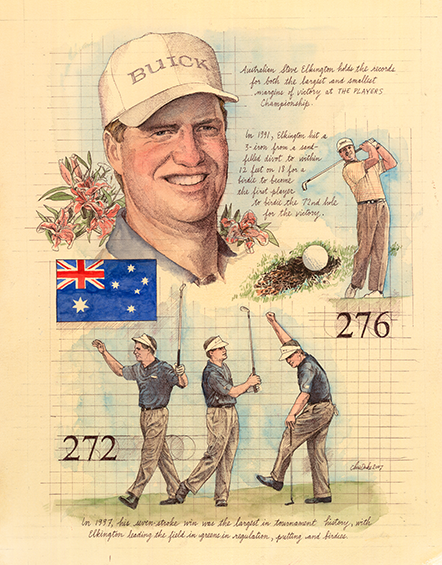 Though a three-putt bogey on 17 for Steve Elkington could’ve shaken his confidence, a birdie on 18 brought the Australian the biggest win of his career up to that point. For 3-and-a-half rounds, Elkington was always there within striking distance, but perhaps few believed he would outshine the game’s bigger names.